Product categories of Shrink Wrap Torch, we are specialized manufacturers from China, Shrink Wrap Torch, Heat Shrink Gun suppliers/factory, wholesale high-quality products of Shrink Wrap Heat Gun R & D and manufacturing, we have the perfect after-sales service and technical support. Look forward to your cooperation! Shrink gun is a tool for packaging some large objects for thermal contraction, mainly be used to replace the thermal contraction packing machines to pack large objects which the thermal contraction packing machine can not pack. 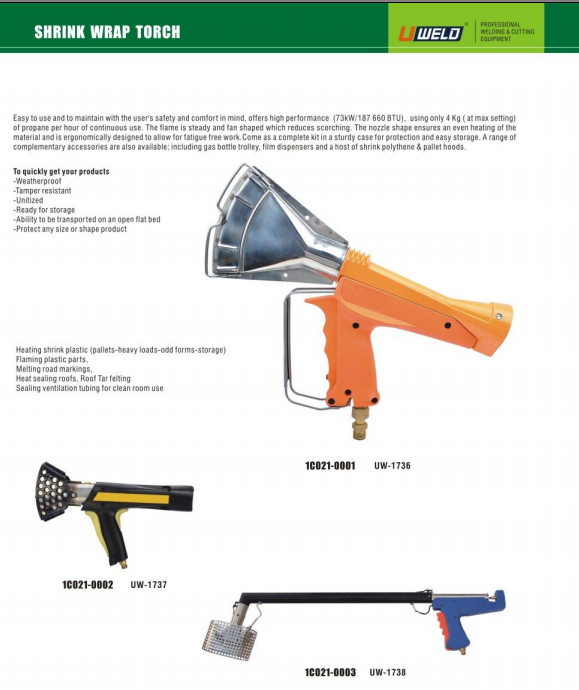 Shrink Wrap Heat Gun has advantages of convenient to be outside storaged, dustproof, shockproof, moisture-proof, rust etc.. Shrink Wrap Torch is suitable for shrink packing of large machinery, precision electromechanical equipment, chemicals, valves, sanitary ware, building materials and so on. The Heat Shrink Kit is handheld, that make its operation very flexible and convenient, the power source is connected to the Gas Cylinder, a toggle switch can fire, the fire was very wide,it has a high efficiency of shrinking. The heat gun for shrink wrap has a high safety, show as when your hand leaves the machine, it will immediately shut down. The fuselage is made of crash resistant plastic, resistant to impact.Shrink gun perform well on PE heat shrinkable film and PE heat shrinkable bags.